Although sorely abused and barely recognizable as a former mansion, the massive scale of the house is staggering. By the decade prior to the outbreak of civil, war brownstone mansions had crept far north of Washington Square. At the southwest corner of 29th Street stood a massive house that rose four stories above a high English basement. Its 30-foot width was about one-and-a-half times that of the normal residential lot, and stretched 100 feet down West 29th Street. A broad stone stoop would have risen to the parlor floor, and the hipped roof was interrupted by circular French dormers which announced this mansion was of the latest architectural fashion. According to The New York Times about a century later, the house “at one time was the home of A. T. Stewart.” The immensely wealthy merchant could definitely have afforded such accommodations. His personal fortune in 1855 was estimated to be $2.25 million. Although he lived in the fashionable Depau Row in the 1840s it is quite possible he moved into this Fifth Avenue mansion prior to building his white marble palace five blocks north in 1870—directly across from the William Backhouse Astor house. Alexander Stewart and his wife, the former Cornelia Mitchel Clinch, would have entertained lavishly in the immense brownstone mansion at No. 264 Fifth Avenue. In 1869 his yearly income made him one of the 20 richest men in history. His fortune by now would translate to about $90 billion by today's standards. Stewart’s limitless wealth came from his dry goods business, the A. T. Stewart & Co. He essentially invented the concept of the department store, recognized the value of customer service rather than overcharging the buyer, and developed in 1876 the idea of mail order business. But even as the finishing touches to Stewart’s new block-wide marble mansion were being completed in 1870; Fifth Avenue was under siege. Hotels rose around Madison Square just three blocks below No. 264, high-end retailers were creeping into the residential neighborhood, and 23rd Street was destined to be New York’s entertainment district in just over a decade. Howard & Co. would stay in the former mansion for decades and its clientele consisted of the wealthiest of New York’s carriage trade. A few days before Christmas in 1899 Howard & Co. advertised “A remarkable large Marquise shape pink diamond with a superb Canary Diamond Drop. Exquisite contrasting colors. Set together as Brooch or pendant.” The gentleman who purchased that piece of jewelry for some lucky lady’s Christmas present would pay $18,000. Or, if that was not extravagant enough, he might choose the pearl necklace advertised on the same page of The Jewelers’ Circular and Horological Review. Howard & Co. promised that “every pearl is perfectly round, free from imperfections, all the same color and that the best, is most difficult to obtain, especially if of any large size.” The necklace was priced at $36,000—about $976,000 today. In the meantime, the suites upstairs were taken by moneyed residents. One was S. S. Sondheim who shared the third floor with P. A. Fachiri. He left the apartment for the summer of 1882; possibly headed to a fashionable resort. The temporary vacancy ended in a messy matter when Sondheim entrusted his furniture and other property with Captain Thomas Collum. The Victorian term “captain” in this instance is what we would call a “superintendant” today. Sondheim returned to his apartment despite the affair and the Knickerbocker Flats got a new super, John Cave (who as part of his employment received the entire fifth floor where he lived with his father and mother). Other tenants in the building in 1885 were Mrs. A. M. Roberts, who occupied the entire second floor; and G. W. Ulshoefer and J. S. Inglis on the fourth. By 4:00 the top three floors of the building were engulfed and “Through an open window in the southerly wall of the building at No. 264 Fifth-avenue, on the southwest corner of Twenty-ninth-street, the flames entered that building.” The terrorized residents watched as fire fighters worked to keep the blaze from destroying their homes. When the fire was extinguished, Howard & Co. sustained no damage and Mrs. Roberts, one floor above, had just “a trifling loss.” Others were not so lucky. Water damage to the Fachiri and Sondheim apartments was about $500, the same amount suffered by John Cave and his family; but Inglis and Ulshoefer lost a combined $2,000 in property, nearly $47,000 in today’s money. The necessary repairs were made on No. 264 to restore the handsome apartments. Among the upscale tenants in 1893 was L. Vaughn Clark, whom The New York Times said “comes from St. Louis, but he is well known in business and club circles here, being a member of the Union Club, New-York Yacht Club, and the Racquet Club.” On April 11 that year his engagement to Edith Draper was announced by the young woman’s widowed mother, Victorine Wetmore Draper. “Both Miss Draper and Mr. Clark are familiar figures in fashionable drawing rooms,” noted The Times. While the well-dressed residents came and went, liveried doormen at Howard & Co. welcomed Livingstons, Vanderbilts and Belmonts. Only families with names and fortunes like theirs could afford to shop here. On November 3, 1899, for instance, Howard & Co. advertised in the New-York Tribune that it had for sale an “absolutely perfect oriental pear shape drop” pearl. “Weight over 85 grains.” The jeweler priced the single pearl at $27,000. 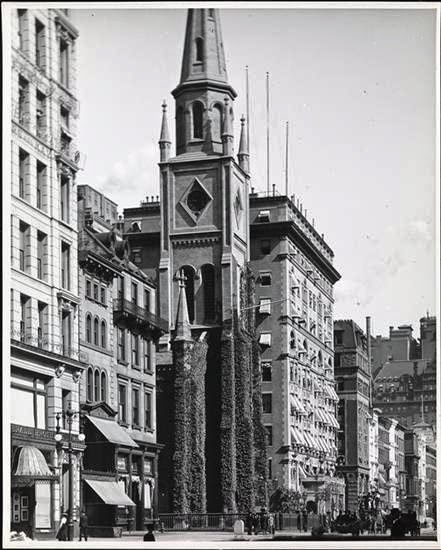 As the turn of the century came and went the high-end retailers inched further up Fifth Avenue, following the northern flow of the residential district. In 1905 Tiffany & Co. opened its opulent headquarters between 36th and 37th Streets; joined by the nearby stores of Gorham, Dreicer & Co., Alvin silversmiths and others; all within one or two blocks of one another and all completed within a year. With the loss of the elegant jewelry store, the retail space at No. 264 became a bit less glamorous. It was taken over by the ticket office of the Southern Railway. In the meantime, however, the spacious apartments upstairs continued to be leased to well-to-do residents. In 1917 attorney Henry Nickman shared a floor with wealthy merchant Edward J. Milliken. Milliken was a partner in the firm of Stuart, Milliken & Co., wholesale jobbers and dealers in hosiery and lingerie. In 1919 Milliken’s respectable bachelor pad would become less so when it was publicized as a pivotal point in the divorce case of his partner Harry P. Stuart. Stuart, who was 46 years old, was married to 26-year old Rose Edith Stuart. Rose had little complaint about her marriage. She told the judge that Stuart “lavished presents upon her, including an expensive motor car, and that he allowed her $100 a month for ‘pin money,’ besides paying all her bills and the household expenses,” said The Evening World on July 28, 1919. But then another woman came into the picture. Unbeknownst to Rose, the pair had gone to Reading, Pennsylvania, where Stuart paid for a hotel, a lawyer and the divorce. But her strong suspicions prompted her to hire a private investigator; who was led directly to No. 264 Fifth Avenue. Only the French dormers survive to provide passersby a hint of the structure's former glory. Another half century was no kinder to the old structure. Today only the wonderful circular dormers hint that this was once a grand residence. All the architectural elements have been stripped away and the brownstone has been painted the color of hot chocolate. Nevertheless, it is one of the last residential vestiges of this stretch of Fifth Avenue for blocks; a fascinating and abused relic. Labels: a. t. stewart, Fifth Avenue, howard and co.